The functionality is represented by the combination of multiple logical events. These events could be simple Boolean expressions. 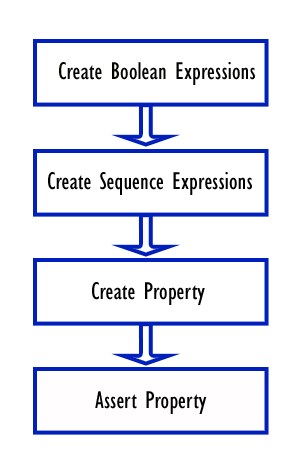 Boolean expression events that evaluate over a period of time involving single/multiple clock cycles. SVA provides a key word to represent these events called "sequence." A number of sequences can be combined logically or sequentially to create more complex sequences. SVA provides a key word to represent these complex sequential behaviors called "property." The property is the one that is verified during a simulation. It has to be asserted to take effect during a simulation. SVA provides a key word called "assert" to check the property.